It’s about time I write my last post about the France trip. I’ve been a bit remiss because I’ve been traveling for work quite a bit in the past few months but I’d like to get this up on the site so I can remember the details. 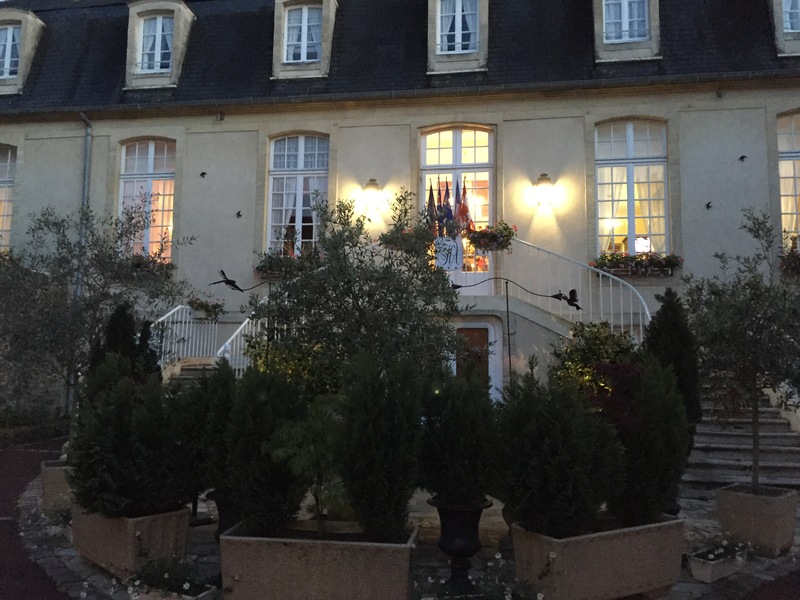 After 5 days in Paris, Gloria Steinem left us to go back to the States, and Mata Hari, Truman Capote and I rented a car and drove to the country for the last few days of our France trip. 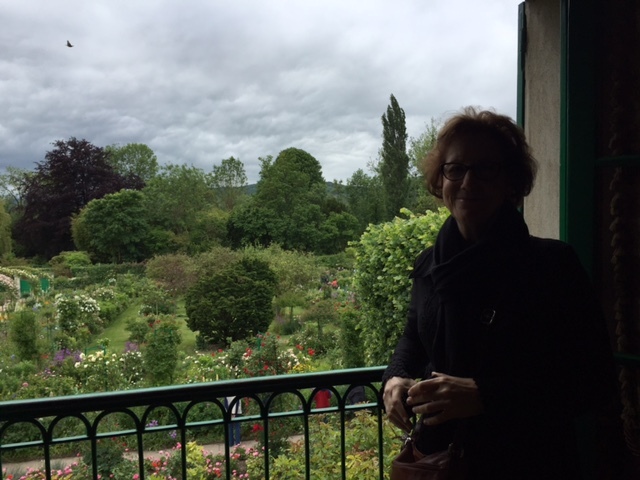 First up was a drive to Giverny, the home where Monet painted his iconic and beautiful water lilies series. The visit was even better than I expected as the grounds are immaculately kept up with stunning, peaceful gardens and a lovely well preserved home. 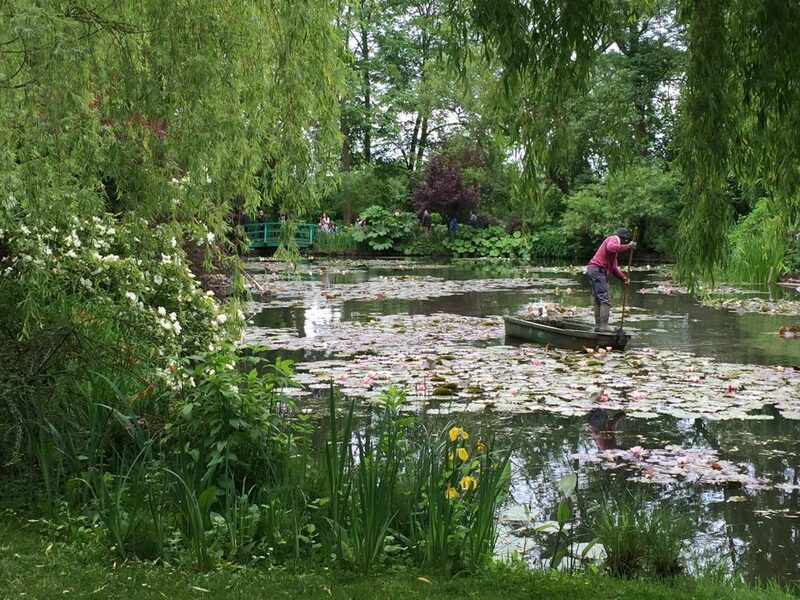 I’ll let the pictures speak for themselves, but if you get a chance, Giverny is a must see and doesn’t disappoint. 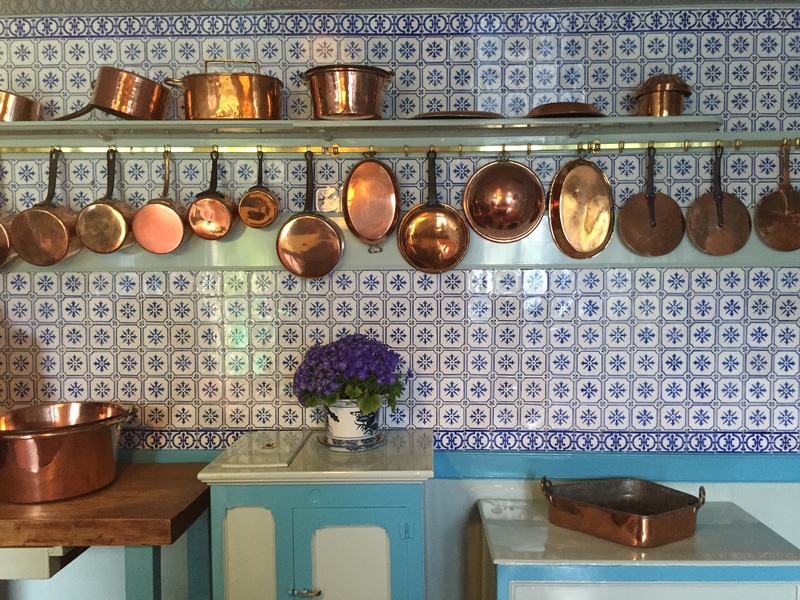 Shiny copper pots hanging on the wall in the lovely blue and white tiled kitchen at Giverny. Isn’t this yellow dining room fantastic? So bright and cheery. 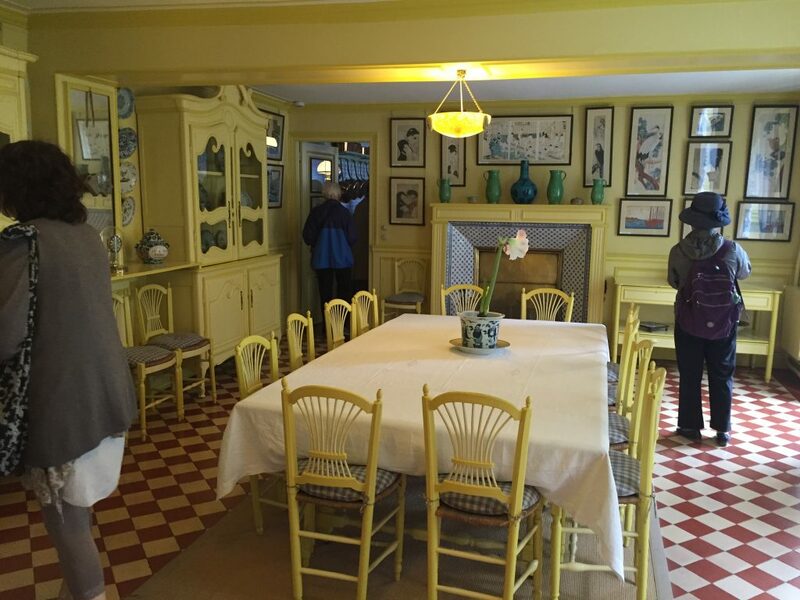 Notice all the Japanese art on the wall, a common theme throughout Monet’s home. The view from Monet’s bedroom. Maybe I’d be an artist, too, if this was the view I woke up to each morning. I just love this image. It wasn’t even posed, this is how the many grounds keepers maintain the water lilies in the pond. Next, we took a quick side detour to Rouens to visit the site of Joan of Arc’s trial and burning at the stake (yes, very macabre to even write those words on a page). She was such a fascinating character in history, I need to read a book of her life; if anyone has any suggestions, please let me know. The site was modest yet very powerful and spiritual. 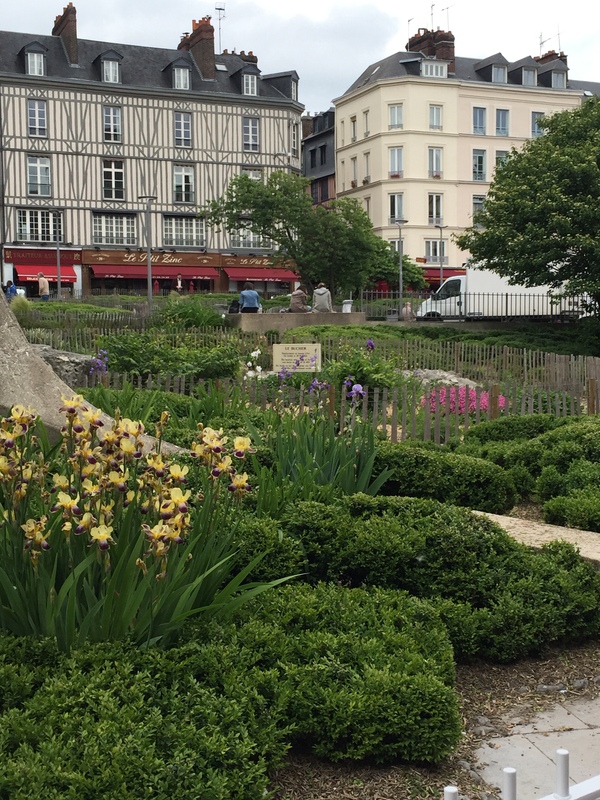 This very humble square is the site where Joan of Arc was burned at the stake. Next we left Rouen to go to the hotel where we were staying in the countryside, in Bayeux. C’est magnifique! And even more beautiful at night. Our beautiful countryside hotel – Hotel d’Argouges, Bayeux, France. The next day was our somber and moving tour of the beaches of Normandy. This was the only formal guided tour we took on the trip and I’m glad we did, as our guide Sabrina was wonderful and we learned so much more than we would have if we’d gone on our own. Sabrina shared vivid details about the French and American heroes and heroines who participated in D-day. 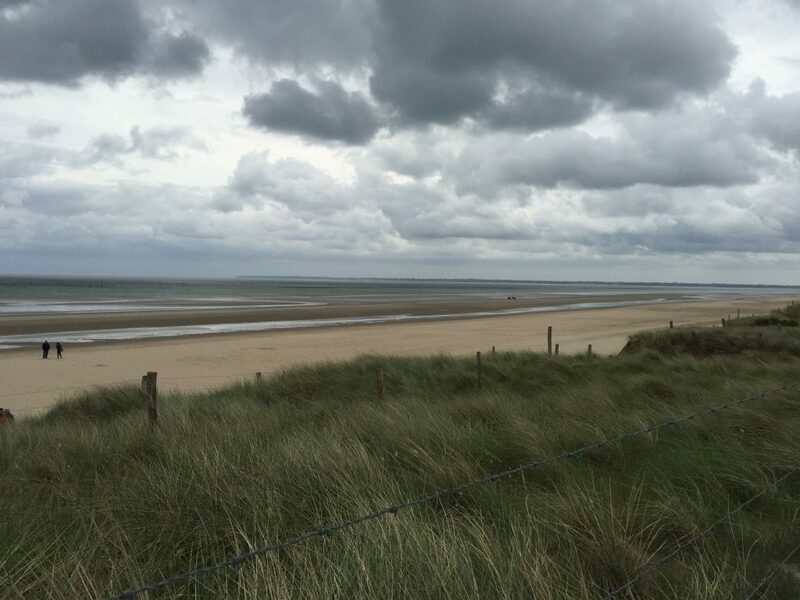 In addition, the van had a video which played as we wound our way through the beaches and cemetery, which featured stories of the American soldiers who returned to Normandy many years later, which was very moving. I now understand why people speak of the participants in this war as The Greatest Generation. If it weren’t for them, we would live in a very different world today. 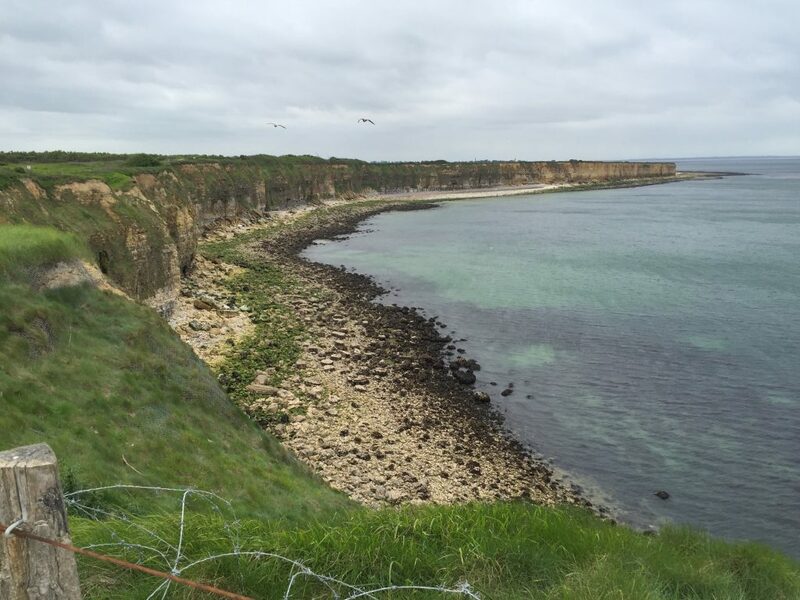 Pointe du Hoc where the Allied troops climbed these cliffs under enemy fire to take out German anti-aircraft gun bunkers. According to our tour guide, the cloudy skies and windy, rainy weather was very much what it was like during the actual invasion. 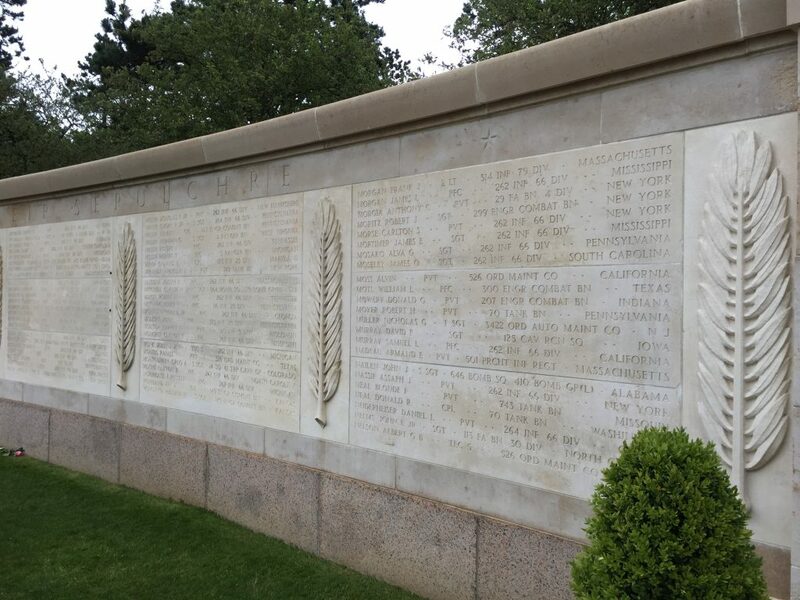 This wall with the names of the fallen at the cemetery was so moving. 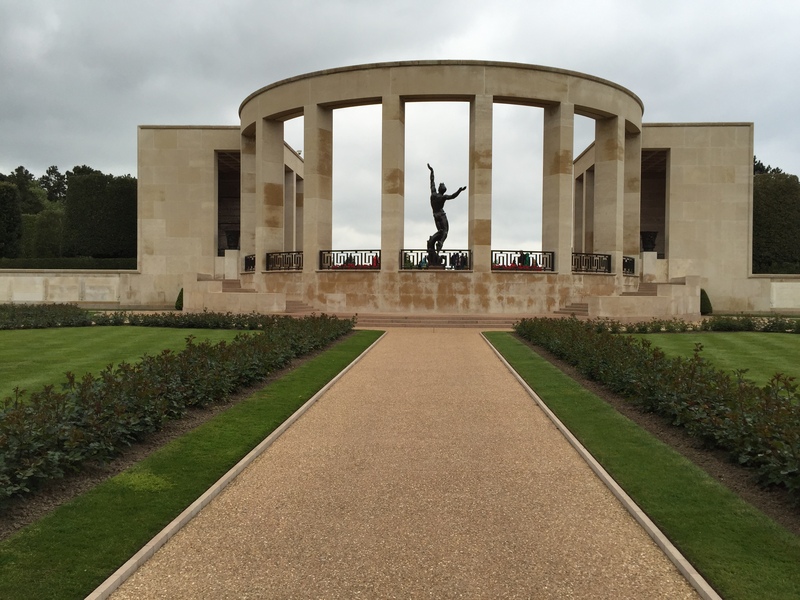 As you enter the actual cemetery at Normandy, this is what you see. It’s extremely emotional and feels like holy ground. When I turned the corner to see the endless rows of crosses which went as far as my eye could see, I almost fell to my knees. Words can’t really do it justice. My father and Mata Hari’s father both served in WW II and this day was extremely powerful and moving for all of us. I have a new found respect for what the allies accomplished during the Normandy invasion and am even more grateful for the sacrifices they made during WW II. And that was it. Our last, wonderful and historical trip in France. That evening we went to dinner at a restaurant recommended by our concierge. We were a bit disappointed when we first entered, because the ambience was rather plain, but the meal was amazing, our best yet! It was a wonderful end to our fantastic trip together. The next morning we were up early to drive to the airport and our flight home. I’m so very grateful that I was able to celebrate the 5 year anniversary of my cancer journey with this trip. ‘And to be able to share it with life long friends made it all the more memorable. Au revoir, France! ‘Til next time. What a fantastic trip! 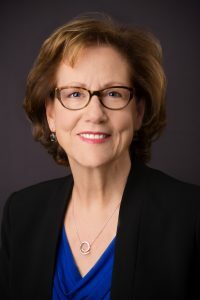 If I weren’t so happy for you I’d be bitter. 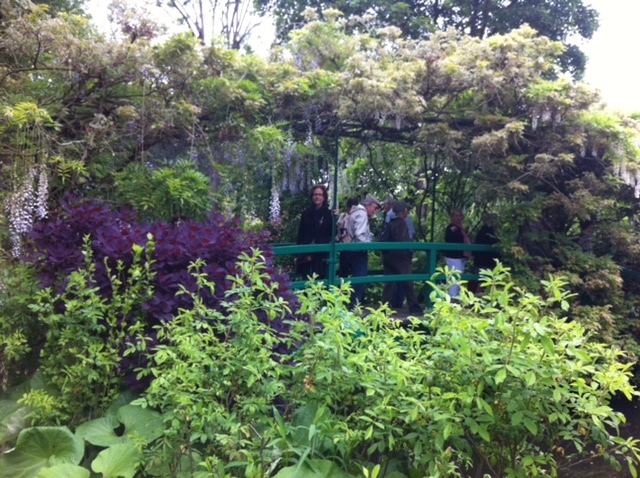 Monet’s garden is to die for, seriously. I’ve got to go. I went to France many years ago on a day trip when I lived in Germany. I was too poor for more than a day. I don’t even remember the town! But it was so beautiful. Why does everything seem better in France? Your Normandy photos reminded me of my trip to Dachau. Holy ground indeed. No one talks. As soon as you enter the gates everyone goes silent. I get teary just thinking about the experience. Hard to imagine today what people went through. Thank you for sharing these. Viva La France! I am so glad you shared the rest of the trip it sounds just an amazing experience every bit of it even the bad luck parts. You will always remember this trip and I am so thankful that you are here and that you got to experience every second of it. Reading your blog, I was most affected by the rows of white crosses, especially the one with a pink rose which was placed at its base. I was very much affected by the ceremony in England where red poppies surrounded The Tower of London – and each poppy represented a fallen soldier or another war casualty. I can’t help but think about all those young bodies lying beneath the crosses and poppies. But on a different track, it’s great that you’ve won your battle against cancer, which is a vicious enemy…well done. 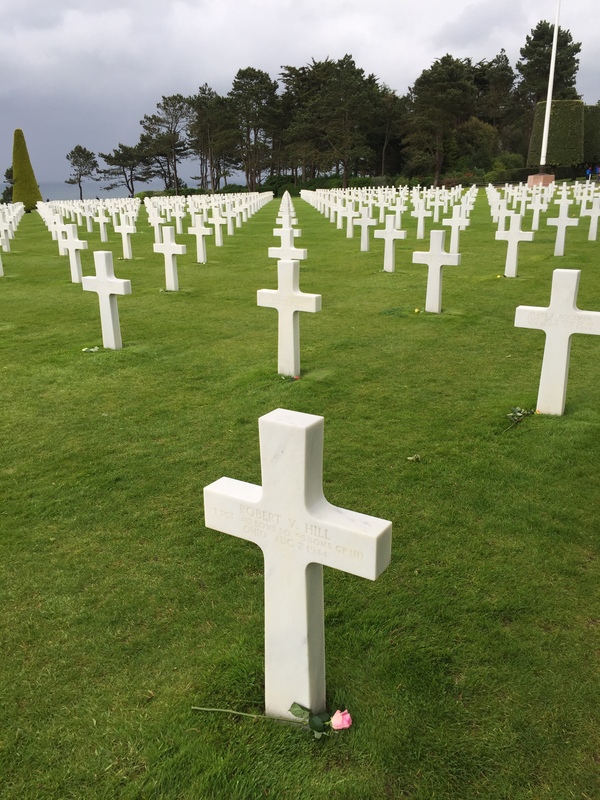 When I turned the corner to see that row of white crosses, I was so filled with emotion. It was quite intense and so powerful. Thank you for your well wishes, much appreciated!